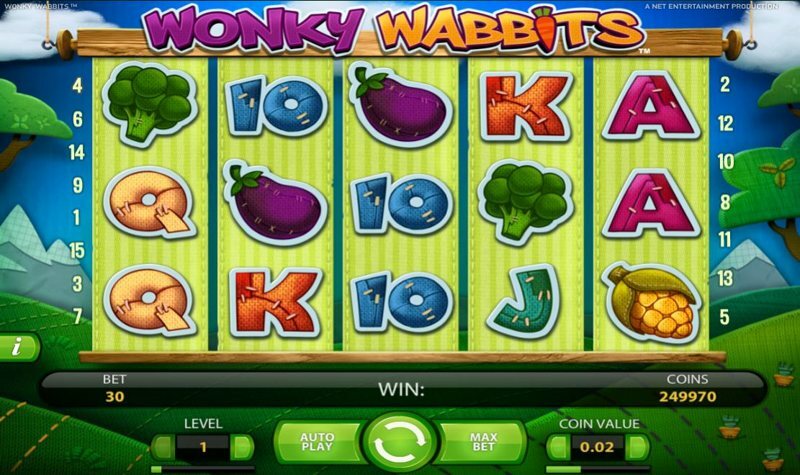 Wonky Wabbits – a Video Slot centred all around the world of Rabbits – is a release from Net Entertainment, and the high winning potential in the base-game has helped the slot become one of their well-known, exceptionally popular amongst players trying to beat online casinos wagering requirements, thanks to the regularity of wins. The game’s bright, vibrant, and filled with character, and while it breaks away from what many would term a ‘traditional Net Entertainment slot’, Wonky Wabbits offers an exciting gaming experience, coupled with one of the coolest base-game bonuses we’ve ever seen come out of the Net Entertainment lab. The design of the slot is consistent with the rabbit-theme, and while it’s nothing spectacular, the scene is set well, thanks to a simplistic design, which ties in well with the symbols, and animations. Symbol-wise, you’ll find – like most Net Entertainment slots – the low-paying symbols are playing cards, 10 through Ace, and the high-paying symbols are game specific symbols, and include Carrots, Tomatoes, Broccoli, Sweetcorn, and more; there’s also a wild symbol, which is hard to miss – it’s purple and yellow, and has the word “Wild” written through the middle. 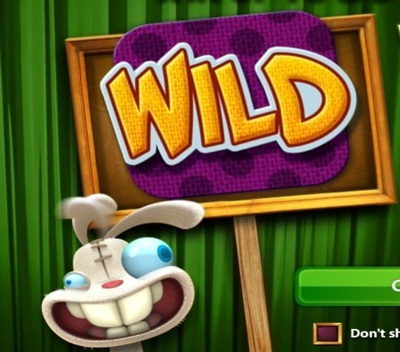 Wonky Wabbits is designed to run smoothly, and is accessible to players on computers and laptops, as well as mobile devices; this is thanks to Net Entertainment’s development team, who ensure that mobile Internet browsers can run the game, error-free. It’s possible to land up to seven wilds on the screen, in a single spin, and when you land a wild, it will automatically duplicate itself, and place the cloned wild in the best possible position, in terms of winning you the most money. Now, land one wild, and this typically isn’t anything too spectacular; land two, or three however, and you’re virtually guaranteed to make at least one 5-of-a-kind of the high-paying symbols, with three wilds forming a wild-line, around 70% of the time. Land four wilds or above, and you’re looking at a 500X minimum payday – usually a lot more – and it doesn’t take long to browse through YouTube and see examples of huge wins on the game – 5, 6, or 7 wilds, and it’s likely to be your biggest win ever. Wonky Wabbits may not be for everyone, and if you’re looking for a slot packed full with features, you’re probably better off with a Net Entertainment alternative like Jack and the Beanstalk or Starburst. However, for players happy to sit through longer gaming sessions, in the hope of scoring a big payday… Wonky Wabbits is perfect.